This lasagna is traditional Italian comfort food with an adventure-friendly, and vegetarian, twist. We use a hearty and organic soy protein in lieu of ground beef — and you may have never known the difference. We never skimp on the spices, so your lasagna will be full of your favorite Italian seasonings. Then there’s the tomatoes, Parmesan cheese, and perfectly cooked, plump noodles. You’ll hardly believe a pot, water, heat, and 20 minutes of rehydration time is all that lies between you and a nutritionally balanced meal. Bon appetite! 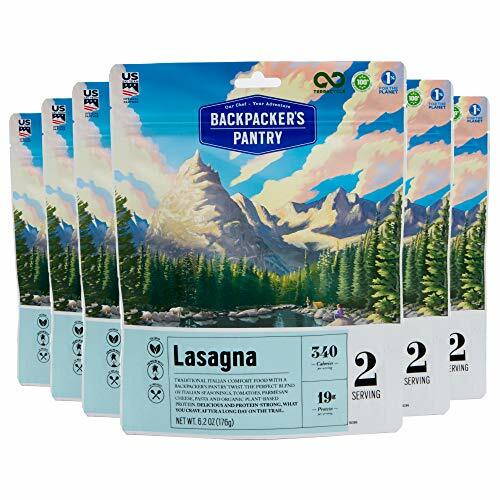 Backpacker’s Pantry Vegetarian Lasagna is an authentic winner with imported freeze-dried Belgian pasta, organic Non-GMO sundried tomatoes, Parmesan Cheese & a ton of international flavor. This is a traditional Italian comfort food with a gourmet backpacking twist. An all-ages crowd favorite Backpacker’s Pantry Lasagna is vegetarian and fast and easy to prepare. Two cups of boiling water and 10-15 minutes for hydration is all you need. With 22 grams of protein coming from Organic non-Go Textured Soy Protein. Rich, hearty and great tasting, this high protein vegetarian lasagna this is comfort food at it’s best. Students, mountaineers, hunters & climbers will appreciate the clean flavors & convenience. Serve two hungry people. Seven year shelf life lets you be prepared for any emergency.